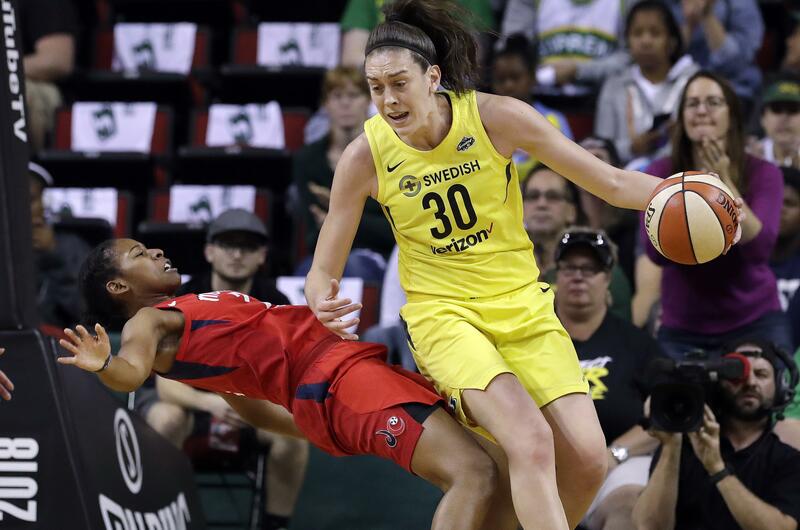 SEATTLE – Jewell Loyd made 9 of 12 shots and scored 23 points, league MVP Breanna Stewart added 20 points, and the Seattle Storm beat the Washington Mystics 89-76 in Game 1 of the WNBA Finals on Friday night. The first WNBA Finals game in Seattle in eight years was a dominant performance by the home team, led by the guard who watched most of the fourth quarter of Seattle’s Game 5 win over Phoenix in the semifinals. Instead of sulking, Loyd became the leader of an efficient offensive performance from the top team in the league during the regular season. Loyd scored 10 straight points during the second quarter when Seattle took control thanks to a 16-4 run, and combined with Stewart to score 20 of Seattle’s first 22 points of the third quarter. Seattle led by as many as 27 in the third quarter and 26 early in the fourth quarter, rolling to the easy victory. Seattle shot 53 percent, outscored Washington 46-28 in the paint and had 21 assists on 33 field goals. Sue Bird, the hero of Game 5, scored just four points, but her points weren’t needed on this night. Natasha Howard added 17 points making 7 of 8 shots. Washington first Finals game in franchise history was mostly forgettable. Elena Delle Donne and Kristi Toliver both struggled shooting. Ariel Atkins led the Mystics with 23 points, but no other Washington player scored more than Natasha Cloud’s 11 points. Still dealing with a bone bruise in her left knee that forced her to miss one game of the semifinals, Delle Donne was 4 of 11, finishing with 10 points and didn’t play the fourth quarter. Toliver scored just five points on 2 of 11 shooting, continuing to be either really hot or very cold with her shot in the postseason. Seattle led by 16 at halftime and yet was able to build the lead with minimal contributions from Stewart and Bird offensively. Stewart didn’t make a field goal for the first 15 minutes. Bird had one field goal and three assists in the first half. The Storm didn’t make a 3-pointer until Sami Whitcomb’s corner 3 nearly halfway through the second quarter. While Loyd was making everything in the first half, Washington’s two standouts were struggling. Toliver and Delle Donne were a combined 3 of 12 in the first half with eight points and four turnovers. Delle Donne was hounded anytime she caught the ball in the post and Toliver was careless with the ball on the perimeter. Seattle took two of three from Washington in the regular season but the Mystics won the final matchup 100-77 late in the regular season. … Before Game 1 Bird and Toliver were the only two players on either team to have played in the Finals. … Among those in attendance were Jamal Crawford, Dejounte Murray, Nate Robinson, hip-hop star Macklemore and Washington Gov. Jay Inslee. Published: Sept. 7, 2018, 8:26 p.m.